My childhood diet consisted largely of grilled cheese sandwiches. After a day of school, I would run to my mother, begging her to make me my favourite snack. At the time, I couldn’t imagine grilled cheese sandwiches tasting any better. But back then, I was only a boy with simple tastes. Anna and I had just finished a 6pm class on Monday night and were on the hunt for something new for dinner, not knowing exactly what we were craving. On Sherbrooke and Marlowe, we discovered Edwina’s Grilled Cheese. We began to read the menu out front and let’s just say that I was in the restaurant before Anna could finish reading. We felt welcome in the modern, homey, and rustic resto. There are mirrors and old photographs in beautiful frames hung on the walls. Next to the entrance is a counter where a diner can sit, eat, and watch passersby. At the edge of the counter is a speaker playing relaxed hip-hop or jazz. There were two high-school students sitting at a table and a middle-aged couple ordering at the front. After consulting the menu, we chose a small table for two in the middle of the restaurant. We selected two of Edwina’s signature sandwiches, The Greek ($7.95) on multigrain and La Parisienne ($7.95). All sandwiches come with a side of Edwina’s house coleslaw and chips. We were served water in a tall, glass bottle, similar to an old spruce-beer. Within a few minutes, our food was served, presented in a small deep-frying basket. The basket was lined with red-checkered sandwich wrap, reinforcing the diner atmosphere. The mozzarella and spinach was a nice addition to the Greek staples in my thick, golden brown Greek sandwich of feta, red pepper, kalamata olives, and tomatoes. La Parisienne was served on a croissant stuffed with Brie, ham, Swiss cheese, and sliced apple. Anna declared that the Brie was a surprisingly good change of pace. Her favourite part of the sandwich was the sweetness from the croissant and sliced apple. After our Grilled Cheese, we decided it was necessary to try Edwina’s famous Fronut ($2.95). We ordered the original Fronut, a grilled, glazed donut with cheddar filling, topped with blueberry jam. The Fronut was unlike anything we’d ever tried, a rich combination of sweet and savoury. For hot beverages, you can order a good; old-fashioned coffee ($1.50) or Espresso ($2.50). You can also try the Smoothie of the week ($3.95), or the Smoothie Shot ($1.95). There is also a soup of the week ($3.95)- added to a Grilled Cheese, it’s called a dipper and only $1.50. An NDG resident for 25 years, Edwina knows exactly what her customers want. “My first idea was to run an ice cream store, but the Montreal winters held me back”, she said. While watching an episode of Shark Tank, Edwina’s “imagination sparked with the idea of starting a grilled cheese restaurant.” She opened June 19, 2014. Fridays from 8 to 10pm, all After-School Specials are priced at $1 and Edwina hosts a jazz group. The Claremont Jazz Trio plays every second Friday. With incredible food, personal customer service, and a trendy St. Laurent feel, Edwina’s earns its spot in NDG’s comfort food scene. 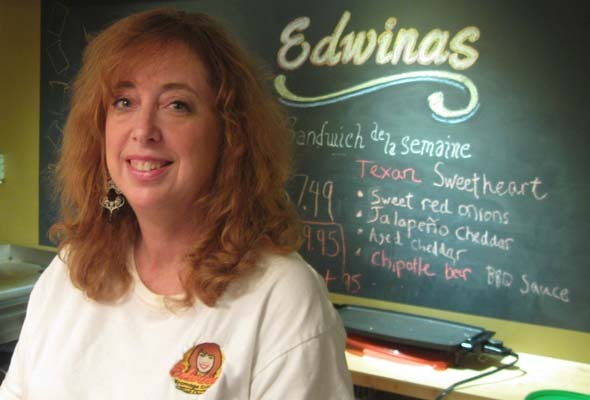 Edwina’s menu is almost entirely vegetarian, with healthy options such as gluten-free bread. 5205 Sherbrooke W. 438-384-3339. edwinasgrilledcheese.com. 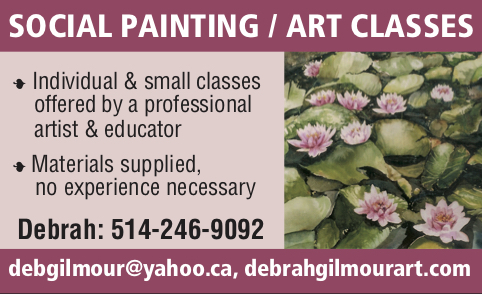 Mon-Thurs 11:30am-8pm, Fri 11:30am-12am, Sat noon-8pm, Sun noon-6pm. Wheelchair accessible. Be the first to comment on "Edwina earns her spot in N.D.G.’s comfort food scene"